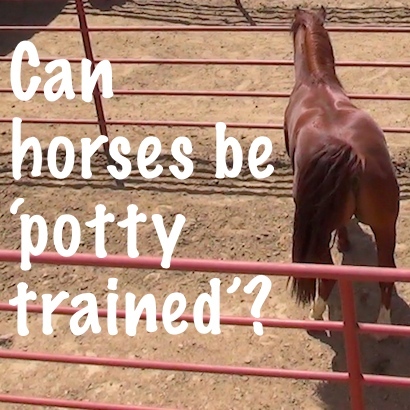 Can horses be 'potty trained'? How do you train them to keep the stall clean? This could be the break-through we have all been waiting for! 1) others have reported that this is possible! 2) I have observed many horses that wanted to ‘pile’ their manure. While I have not personally tried this, I have seen a horse that was trained to go outside the stall as you describe. I was young when I met the horse and owner and didn’t ask many question but my mom also remembers it and verified it. I will also share a link below to a forum discussion on the subject. I HAVE personally observed that very often horses will pile their manure. I have heard and read several theories on the subject (yes, I study horse poo). One observation that can be read about takes place In the wild horse population where the manure piles are called ‘stud piles’. People have observed that the stallions seem to mark their territory by piling their manure. I have had my fair share of stallions, mares and geldings over the years and I have noticed that the stallions do tend to have a stronger tendency. Maybe stronger tendency is the wrong phrasing…they seem to have a stronger motive. 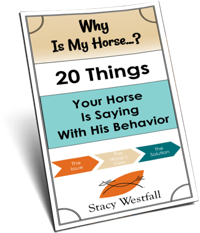 I have had many mares that were ‘clean’ in their stalls because they piled the manure, and some geldings as well, but the stallions do seem to have another motive. I have seen stallions, when turned out in a common area paddock, walk around and poop on top of each pile of another horses manure. It was funny as the amount got less and less, lol, but the intent was clear=I’m marking my space. Another theory I have heard is that the horses in the wild tend to pile the manure as a back up plan. This theory includes all, not just the stallions, and says that during extremely bad winters the horses can return and dig up the piles to eat. Compared to eating tree bark or starving I would guess that this could be pretty effective. Now I need to know…has anyone else ‘potty trained’ their horse? Over on this horse forum you can read a thread about this subject. I have a gaited gelding who has trained the other horses to pile their manure. It’s great! Not sure how he does it, but I doubt I will ever sell him – I like having a manure pile I can go after now and then rather than the daily scooping. I also had an Arab years ago and we tried riding on a drill team (that was a mistake 🙂 ) One of the first times in the arena he stopped to pee as soon as we rode in. Everyone looked and laughed while they waited for us. That’s all it took – he stopped and peed outside the arena gate every time after that. I live in Marin County California and everyone is up in arms about horses pooping on the trails. I am going to try to get them to move over to the side to keep the manure off the trail. Wish me luck. My theory is that horses pooh in their box in winter because they want to lie on it to keep themselves warm. This is really frustrating because as soon as they enter the clean box with the wonderful high straw bed they pee on it. It is similar to when you shower a horse and let them of the lead they march off immedeadly to lie down and role in the sand. My horse Scar poops on the pile I have made. I see that recently my other horse, Silver, has taken after him. Wonderful! But, it doesn’t always happen like that. Most of the time when they can get to it, they will do that. Yes I have potty trained my horse at 14 years old . I have had him for approximately 5 months now. He now walks out of his stall when he has to poop. Loving it and it saves on shaving! I’ve trained my gelding, who lives in an open stable to go in only one corner of his paddock, so I’m faster with cleaning up. My mom and I have trained our two draft crosses to go into the paddock, pee, then return to their stalls. I just open the gates individually and let them go out. My horse doesn’t like messing his stall up anyway, so he is pretty much self trained. My gelding has been like this from the get go. We stall them at night and leave his back door open to his paddock. No training whatsoever, he has always gone potty in the paddock…never his stall. My filly was raised in the stall and was quite used to pottying in it. But we have started leaving her stall door open to the paddock at night, as well. Most times, she pottys in her paddock also. I think they would rather not lay down where they have pottied, if possible. Just my thoughts! I have the opposite situation I’m afraid. I have one horse, a mare. As soon as a human enters the barn where her stable is she pees. Even if she doesn’t have to go you can see her try to squeeze out even a drop if she can. She saves her poo for the stall also and never likes to dirty her pasture if she can help it. As soon as she comes into the stall from the pasture she urinates. Does anyone know why she is urinating when I enter the barn. I would appreciate any insight on this problem of mine. I have a gelding that does the same thing! I have a mare that does the same thing!! She prefers to urinate in her stall and seems to “hold it” all day until she comes in. I would love to break her of that habit and have her urinate outside before coming in. I have three mares that poo outside in their yard and not in their stable and the poo in the corner or sides of the yeard just in case they want to lay down outside. However they don’t mind peeing in their stables. My filly however poos in the stable in the yard and walks all the way through it so it takes ages to clean her stall. I wonder if she does it because I have it so easy with the other girls LOL. I went to a big nature reserve with wild horses in the Netherlands this summer and what struck me indeed were those massive horse poop piles. Either these horse return time after time to their own pile, or all poop together on their travel! Given the chance horses are clean animals. Watching horses in a large field they generally do not graze the grassy area where they have relieved themselves. This gave me the first clue they could be taught to relieve themselves at a certain time on a certain area. Our horses have a dry lot area left open to them. Where they have learned to go when they need to relieve themselves. You can watch them purposefully leave the grass feeding area, go and relieve themselves and then return to grazing. Given the chance a horse will not poop or pee near virus food. Watch horses in a large field. They generally do not graze where they have relieved themselves. The smart horse will self teach itself that it increases it’s grazing space by relieving itself in one small area. A really smart horse will take this behavior to the stall or pen. Horses also do not like to lie in their own waste. I have trained horses to wait to relieve themselves and where to relieve themselves. Seems not as many people do this with horses as dogs. Perhaps due to the fact dogs live in our homes for the most part. I have a lovly stallion that laptop peeing on the shavings in his stall. Cement floors with rubber mats. So a lot of work to wash out. Took the perfect on shavings and put them in the paddock. Then dug a little latrine with a trench to move the pee out of the paddock. The vet fonnd this amusing. Manure neatly piled and a self cleaning latrine for pee. No more moving those heavy rubber mats every weekend to hose out the stall. My horses eat outside, leave there food go inside the shed and poop, I’m like what is this your litter box! My horse poops in our trailer but never pees there, even on month long camping trips from California to Montana. We stop a couple of hours into our drive, take him out, he pees and we put him back in – kind of like our dogs. “Go pee” is what I say to them and they do – dogs and horses, alike. If we drive a long distance, the time between stops lengthens to 3-4 hours. My husband’s horse doesn’t pee as often and takes a little longer to do his job, but he seems to have learned from his buddy. Sure keeps the trailer cleaner! And yes, he poops in a pile in his pasture – rather fastidious. Of course we have other horses who are indiscriminate in their habits, going right in their eating area. For a while my horse lived with one of the worst offenders and I felt sorry for him – kind of like The Odd Couple – and moved him. I have taught all my horses to pee on command. It was very easy to do, every time they would start peeing I would start whistling, then rewarded them with a treat. I did this over a weeks time I’d catch them peeing, I’d whistle. Soon all I’d have to do is whistle and they would pee. Even my friends horses were catching on to the whistling. They would all stop and start peeing when I whistled! My gelding does not pee in his stall. Several years ago I ran out of shavings one day to put on my rubber mats. After a couple of days I realized he was no longer peeing in his stall. Now when I call him up to put him in of an evening he stops and pees and does not wet his stall at night. I have quit using shavings. I keep a close watch on his hocks and he does not sore them. He does not lay down. When I lead him out of the stall, he stops and pees before I put him on the trailer if I am going riding. I now have had 3 geldings and a mare who have done this. I can deal with the manure. My first horse had this in the bag when I got him. My second (present) horse would pee in the shavings in his stall. I shamed him out of it, and he poops and pees in his turnout area now :-). Horses are smart; don’t let them fool you! Fortunately my horse that I bought last October does not poop in his stall. But I also did not want him to pee in it either. He has a 100 foot run out the back of his stall. So the first week I bought him and when I would take him back to his stall, I would walk him to the opening to his run, and I would say to him, “Go potty” and I would send him out to an area that has deeper sandy dirt. At first he would run out there and immediately turn around and come right back to me. But I would send him right back out and again say, “Go potty”. He would stand there and stare at me and I kept repeating my command. Pretty soon he would start to stretch out and soon he would drop and go pee. I would say, “Good boy”!! Then as soon as he came back to me I have him a piece of carrot. Now he does his pee out there in that spot all the time and not one single time has he peed in his stall. I have on occasion told him to “Go potty” when he was out in the arena but that may have just been a coincidence. The mini people who take there mims to nursing homes, hospitals and schools seem to have their minis poop and pee free while they are in those environments.??? Hope one of them share their secret. I have a 7 yo American Warmblood that “stuck’s pile” her manure in one corner of the 2 acre field. We have 2 smaller sections and she does the same thing; only one designated corner; as well as in a stall. Technically, we consider that “potty trained”. Also, she only goes poo in the trailer as soon as she walks in: she patiently waits for me to carefully put the manure fork under the tail and off she goes. Never, never has she gone pee in the trailer but once she had a gelding that hitch a ride with us and pee in the trailer and she got very upset!!. I know Roy Rogers had a house trained horse that he would take into the children’s hospitals. That was the first time I had heard of it, and he was doing that back in the 50’s. My mom trained her horse to pee when she whistled “Old McDonald”. She would just whistle every time she saw him peeing and pretty soon he started to stretch out and pee if she would whistle that tune. It worked really well for competitive trail rides. My mom had a friend who trained her horse to go into a bucket but I never had the chance to question her about it! I’d love to know. My gelding always keeps his manure in a pile – he is the first and only gelding I have only had that is so particular about such things lol. He is also the most kind and willing to please horse I have ever owned, correlation? Who knows but I love him! My horse’s all **** along the fencing side, they all know this as its a routine to me to clean the paddocks every couple of days.. so much easier when there toilet trained. . When my boy was young I took some of my mare’s manure to a corner of his stall. He sniffed it as is predictable. But by consistently doing this, he began to target and pile his in that corner. It worked so easily that I did the same in the mare’s stall with my boy’s manure. It worked for her too! Yes, we have 3 horses and my 10 year old gelding is a mess – We are in Quebec so winter is cold and they are in a lot. for about 2 month I would go every morning, feed the horses and if the weather allowed it, I would send them out. Then I would clean their boxes and always my horse first, then I would take the freshest manure from the other two and put it in a corner in his box, to bring out this natural instinct of wanting to cover it up with his own. I would have to go again before bedtime otherwise it became a mess. I was not consistent enough but I did see a result after 3-4 weeks. I will get at it again this fall when they start to sleep inside. Ps. Thank for being such an amazing inspiration. my summer pasture has a wind shelter and the horses use it a lot. they get fed oats at the shelter and their water is about 50′ from the shelter. there is no poop or pee anywhere in the area around the shelter or water. its all their choice. When my horse had an eye injury and was confine in the small corral, she would relieve herself at the far end, away from the shed with the water trough and where we fed her. I read an Equus article years ago about a woman who created french drains about 3 ft across in front of her sheds and trained her horses to pee there. My horse is stalled and uses the back of his stall for his business. Now if I could only get the guys who clean and feed at my barn to put the hay up front! 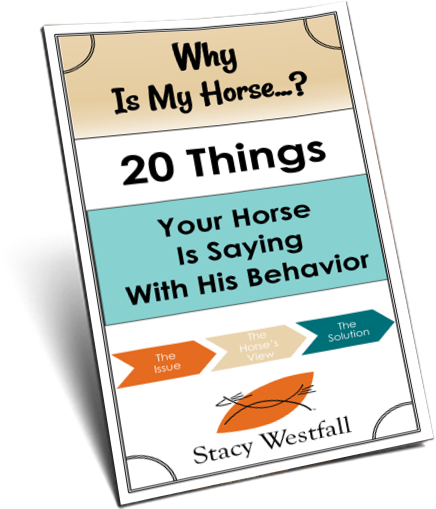 They don’t, they say, because my horse dunks his hay in the water buckets in front. I have had a hard time explaining to them that I don’t give two pins if he dunks his hay but I don’t like him to have to eat out of his toilet! Argh! We have a mare who has never gone in her stall, in the barn alleyway or in front of the barn. We didn’t train her – she just does it on her own. Some days I’ll let her out in the yard to eat and she won’t go in our yard either. We had a gelding, who passed away last year, who did the same thing. Our other 3 geldings go wherever they feel like going – ugh!! To train a horse to do that is awesome!!! I wish! My boys – in particular my hubby’s boy – are total pigs. If there is reincarnation then Zeus was someone like John Belushi in Animal House. They have a run in shed in their pen and they poop and pee right in it. Even where Zeus eats his pellets. They then tromp about and scatter and smash it. Worst housekeepers ever! A friend of mine whistles every time her horse urinates if she is riding her horse at that time. The theory is that if you whistle every time the horse will associate the urination with the whistling, and (just like Pavlov’s dog) will learn to urinate when you whistle. That way, you can have your horse empty its bladder when it’s more convenient for the rider, i.e. before long trailer hauls, during your own pee break on a trail ride, etc. She claims it works.